The Canon Pixma Pro-100 is the most affordable of Canon’s professional photo printer lineup, but that doesn’t mean it skimps on quality. Build, feature set, and print quality are all above entry-level, and it manages to pack a lot of punch for the price. 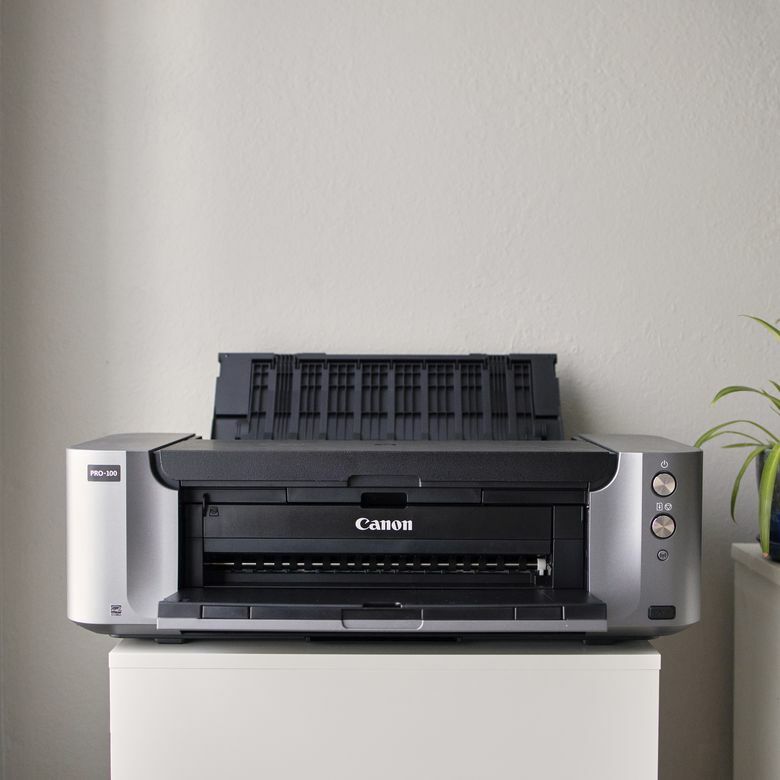 The Canon PIXMA Pro-100 is Canon’s entry-level offering in its professional inkjet photo printer lineup. It features an eight-ink system and a maximum borderless print size of 13x19 inches, matching Canon’s more expensive photo printers. While it can easily print documents, the PIXMA Pro-100 is designed with photographers in mind. We’ve gotten our hands on one and have put it through the paces to see how it performs when put to the test. From design and setup to the print performance and price, we cover it all. It’s difficult to talk about the design of the PIXMA Pro-100 without first mentioning the size of this thing. The PIXMA Pro-100 weighs a back-breaking 43.2 pounds and measures in at 15.2 x 27.2 x 8.5 inches. While that might not be so great when it needs to be moved, the build quality of the PIXMA Pro-100 leaves little doubt about the durability and ruggedness of it. The PIXMA Pro-100 features a very square design and a very cuboid design, aside from the rounded edges on the four corners of the printer. When not in use, the various paper holders and trays fold up and nicely latch in place to make for a much cleaner look. The latching mechanisms for the paper tray and print holder use very solid contact points, which gives the printer a premium feel as it’s opened and closed before and after use. There are only three buttons on the device: the power button, a paper feed button, and a dedicated WPS button for instant wireless connection. As with other Canon photo printers, it would’ve been nice to see a screen of some kind for viewing ink levels and navigating the menu, but Canon seems to have reserved that for its all-in-one printers and much more expensive ImagePROGRAF Pro-1000 printer. For being a professional inkjet photo printer, the PIXMA Pro-100 is a breeze to set up—Canon provides all the necessities to get off the ground inside the box. After removing the printer, cables, ink, printhead, discs, manuals and accessories from the box, the first step is—wait for it—to plug it in. From there, the printhead access lid needs to be lifted so the printhead and ink can be installed. We went through the process of placing the printhead and ink cartridges in place in the matter of 90 seconds or so—a process that was aided by ink cartridge compartments that lit up green when the cartridge was properly installed and red when incorrectly installed. After the ink is installed, the PIXMA Pro-100 goes through its ink initiation process, which takes a few minutes. While it did its thing, we took the time to install the proper drivers and accompanying software. Rather than using the discs included in the box though, we opted to download the various drivers and software directly from Canon’s PIXMA Pro-100 download page because we didn’t have access to a CD drive. For being a professional inkjet photo printer, the PIXMA Pro-100 is a breeze to set up—Canon provides all the necessities to get off the ground inside the box. Since it’s a serious printer meant for professionals, Canon offers a few extra plug-ins and programs to fine-tune nearly every detail of the printing process. For our tests, we installed the Adobe Photoshop/Lightroom plug-in so we could print our photos directly from Lightroom. The various software took between 8 to 10 minutes to install in total between locating the programs we needed and going through the actual installation process. Once we had the drivers and software installed, we connected our computer to the printer via the included USB adapter. We set up the wireless connection using the integrated WPS button, but ultimately decided to use a hardwired connection for our testing since we were printing large photos at high resolutions. Inside Lightroom, we used the Canon Print Studio plug-in to print full-resolution photos directly from Adobe Lightroom, a process we dive into a little more in the next two sections. As previously mentioned, all of the required software to get started is included in the box with the PIXMA Pro-100. Alternatively, you can download the drivers and programs directly from Canon’s website, which is the option we went with due to our computer not having an optical disc drive. Installing all of the programs can take some time, but it’s a one-time ordeal and updates can be automatically installed going forward. Being a professional photo printer, the various programs and plug-ins, such as Canon Print Studio, can be a little daunting at first. But after five or ten minutes playing around and making a few test prints, it was easy to get the hang of it. The ability to add Canon Print Studio integration directly into Adobe products is a nice addition as well, as it makes for one less step in the post-production process. Installing all of the programs can take some time, but it’s a one-time ordeal and updates can be automatically installed going forward. As we noted above, the PIXMA Pro-100 offers Wi-Fi connectivity. In order to set it up using the dedicated WPS button on the front of the printer, you need to have a compatible router. Otherwise, you must first plug in the printer using the included USB port and manually enter the wireless settings for future use. If you prefer a wired connection as we did, the process is even easier, as it’s a standard USB plug and you’re off to the races. Same for the integrated Ethernet port—just plug in and you’re good to go. This printer was made for printing photos, but in the event you need to print off a standard document, rest assured the text and any graphics will look fantastic, even on standard printer paper. We tested various typefaces at varying sizes, from 8 point all the way up to 72 point and all of the text turned out fantastic. Various charts and graphics also turned out great, as you’d expect from a printer like this. Moving onto what the PIXMA Pro-100 was actually made for, the photos this printer spits out are stunning. For our tests, we used the Canon Pro Luster photo paper and printed our images from a color-calibrated MacBook Pro using the Canon Print Studio plug-in for Lightroom. After a few test prints to ensure everything was calibrated correctly, the PIXMA Pro-100 had no problem printing off borderless 8.5x11-inch prints that looked fantastic. We did notice that it occasionally struggled with showing the detail in shadows, but the plug-in does allow for compensation, which helped produce more pleasing results with a bit of fidgeting. As with all professional photo printers, one of the key elements to our tests was the calibration. To ensure your print will look exactly like it’s being displayed on your computer’s screen, you’ll need to ensure your computer’s screen is properly calibrated, you have the right paper profiles for proofing (all of Canon’s papers and many more manufacturers are already installed in the Canon Print Studio software), and your various compensations are accounted for. If you go through the effort, the results will speak for themselves. Canon rates its ChromaLife 100+ ink for over 100 years, but there’s no way to put that claim to the test. Still, it’s safe to say prints made with Canon’s ink on this printer and quality paper will last for decades to come if it’s kept in a UV-protected frame and out of the way of direct sunlight. The dye-based ChromaLife 100+ ink cartridges used by the PIXMA Pro-100 might not give the precise tonality and long-term life of the LUCIA Pro pigment-based inks of Canon’s more expensive Pro-10 and ImagePROGRAF Pro-1000, but what it lacks in those departments, it makes up for in extra saturation and darker blacks. The Canon PIXMA Pro-100 is officially listed on Canon’s website for $500. However, on B&H Photo, the printer is listed for $360 with a $200 mail-in rebate, which brings the final price to $160. These rebates are common for this particular printer and if you keep an eye out, there are times when the PIXMA Pro-100 can be scored for $100 or less if purchased with a Canon camera. It’s more expensive than your drugstore down the road, but the results are well worth the difference in price. A full set of ink for the PIXMA Pro-100, which includes all eight ink cartridges, costs $125. Trying to nail down an exact cost per print is difficult due to fluctuating prices of supplies, the paper used, and other variables, but our math shows that a standard 8x10-inch print costs somewhere in the range of $1.50 to $2 a piece by the time you take into account supplies and the cost of the printer itself given a lifespan of five years. At that price, it’s more expensive than your drugstore down the road, but the results are well worth the difference in price if you don’t mind going through the hassle of making the prints yourself. Dollar for dollar, you’ll have a hard time finding a printer that gets the results the PIXMA Pro-100 does for under $500. The Canon PIXMA Pro-100 is most easily compared to Epson’s SureColor P400 Wide Format printer. Both printers have an MSRP of $600, but retail for far a good bit less and offer similar feature sets. Both printers offer a maximum print width of 13 inches and use eight ink systems to create incredibly vibrant prints using dye-based inks. Even the designs of the two printers are similar, with fold-in trays and holders and a noticeable lack of any screens. The PIXMA Pro-100 has a better maximum resolution at 4800 x 2400 compared with the SureColor P400’s 5760 x 1440 dpi resolution. The PIXMA Pro-100 also prints a little faster at roughly 50 seconds for an 8x10 inch print compared to 68 seconds for the SureColor P400. At the time of writing this, B&H is offering the PIXMA Pro-100 and Epson SureColor P400 for $160 and $360, respectively. At that price, and considering the feature set, the PIXMA Pro-100 comes out on top, especially if you can find it on sale or take advantage of a rebate. Interested in other options? Read through our list of the best photo printers on the market. A big printer with the ability for big results. The build quality is incredible, the prints that come out of this printer are pristine when properly calibrated, and while the ink isn’t exactly cheap, the printer itself offers a lot of bang for your buck, especially if it can be found during one of Canon’s frequent rebate offers. It’s not tiny, so you’ll need some space, but if you’re serious about getting great prints at home on a sub-$500 budget, you won’t find a better printer out there. Product Dimensions 15.2 x 27.2 x 8.5 in.